Well this year the Daytona 500 had new rules and more to it leaving many fans wondering if it would live up to it's expectations, and yes it did! An amazing start and finish, this 500 has left fans breathless and one driver, named Trevor Bayne a happy camper. 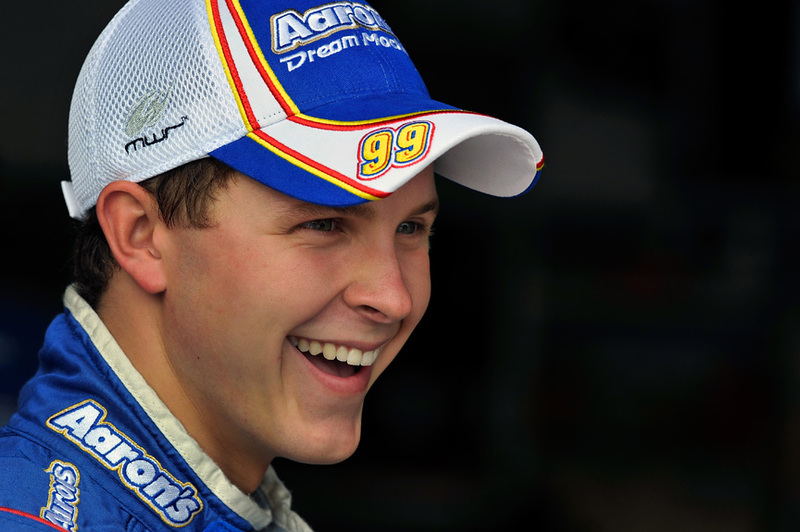 Trevor Bayne, who turned 20 just yesterday won the Daytona 500. He is the youngest NASCAR driver to win it. Let me tell you all i am truly shocked and impressed with what Trevor brought. 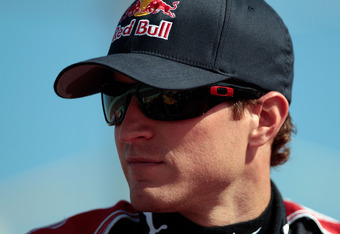 Some epic wrecks and more, he pulled out a win that fans can say was truly a work of God. Happy Bayne, went to Victory Lane and was beyond joyful. 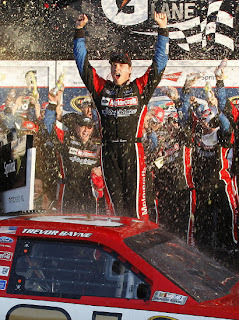 Congrats Trevor Bayne on winning, you deserved it and won it well! Now let's get to the Daytona 500 race entirely! This year the drivers had to go with a new way, "dancing partners" many have said as a way of driving. Not like last year with everyone at it, but now pairs trying to get one another to the front. After watching Nationwide on Saturday, many were skeptical about how today's race would end up. I saw that the pairs worked very well for many drivers. 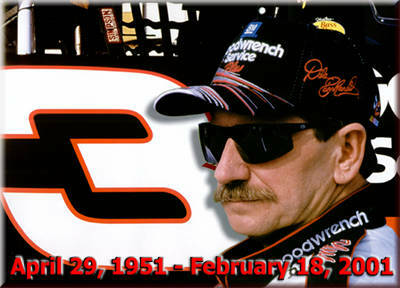 In honor of Dale Earnhardt Sr. at the 3rd Lap everyone was silent and raised three fingers in honor of him. A great and excellent way to pay tribute to one amazing and never forgotten NASCAR driver. It only took to lap 5 for our first caution to emerge, Kyle Busch spun, but recovered well causing no wrecks. At lap 11 J.J. Yeley who qualified into the 500 had issues himself, a tough break for him. Dale Earnhardt Jr. was almost spun by Martin Truex Jr, but was not and recovered well himself. Little later into the race we picked up another caution for Kevin Harvick, driver of the number 29 Budweiser, his engine gave and blew. He was done for the day and many unhappy Harvick fans were disappointed. Nothing could prepare fans for what happened at lap 29 was the BIG ONE. In better words, it was 1 of 2 BIG ONES. It started with one driver sliding a bit then multiple cars began to crash into one another, the end result was 17 cars in the wreck, 12 had to go to the garage, and the other 5 could pit and get the damage taken care of. The rest of the race there were multiple cautions from the #37 getting into the wall, to Jeff Burton's engine blowing out, Matt Kenseth hitting the wall, Travis Kvapil having a bad run and more. NASCAR had a total of 16 cautions, a new recored beating the old 12 cautions for Daytona. Not only that but there was also 69+ leader changes beating the old record as well. Drivers switched partners many times, wherever they may be at on the track. Behind or in front, drivers did there best to pull forward to the front. Getting down to the last 20 laps, fans everywhere were getting to the edge of their seats. I know me and other fellow Twitter people were jumping like crazy at the last 10-5 laps. We went into the "Green-White-Checkered" rule. Go around once on green, take white, next lap is the checked. Well one more wreck to get 16 cautions, then they had one more go at "G-W-C". 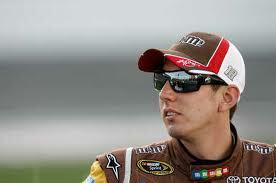 Well with everyone on the edge of their seat, Trevor Bayne lead the way and pulled out the victory. Carl Edwards came in second, followed by the rest of the line up. What a way to start a 2011 season i say! 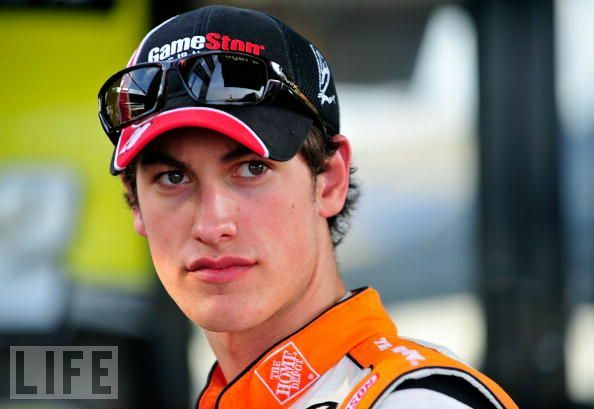 :) 200 laps of intense racing at Daytona left fans speechless and happy. Even on twitter Trevor Bayne and other drives became "Trending" topics. :) Fans approve this awesome Race. I picked 5 Drivers to be possible wins, also picked a "Dark Horse" and "Wild Card" Pick as well. one of those drivers did win for me and i am proud of it. 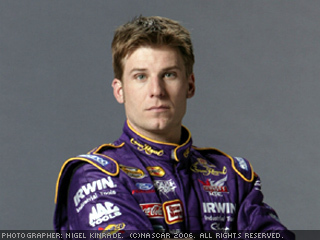 -Teamed up with multiple cars, including the 88 of Earnhardt Jr. Overall, the guys i picked had a tough but good day. 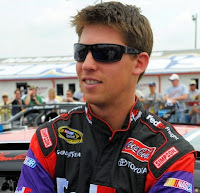 I am proud that Trevor Bayne, my dark horse pick one. What a incredible win to obtain, and good job to Jamie Mac as well on his top 10. Let me tell you all this opened up the 2011 season very well! I cannot wait to go to Phoenix next weekend for the Subway Fresh Fit! :) I will see you all there and blog about another amazing race! WELCOME BACK NASCAR! 1) how do you feel about Trevor Bayne Winning? 2) Do you think Jimmie Johnson will rise up after this weekend and starting winning a lot this season? 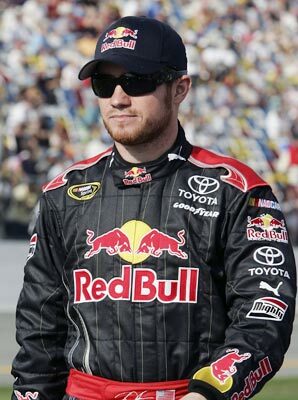 3) What do you think of NASCAR new rules and format? Note: I am sorry for any screw ups on anything. It's hard to write and look at the screen, i did the best i could on this blog! I will try to cover as many races as possible this season so keep looking for my blog and i will try to cover everything from the drop of the green flag, to the checkered flag and Victory Lane. 1) I am EXTREMELY happy and suprised that he won. I am still in shock! 2) I really hope Jimmie Johnson has a bad year this year. someone needs to dethorn him!